I’ve been on Facebook for approximately six months. I resisted for a long time, but caved in eventually. While there are many things I dislike about Facebook, it can be an interesting trip down memory lane (As Lev Grossman wrote in Why Facebook Is for Old Fogies, “son, we’ve lost track of more people than you’ve ever met.”), and it can also be a way to create new friendships and nurture current ones. Facebook should be fun and not the source of stress. However, recently Facebook was becoming stressful: my students were sending me friend requests and I was having a difficult time deciding what to do. Because of my no stress rule, I had to do something. Almost always the request came from a student that I like—one who I’ve had in one or more classes or who I know through my role as a DJ at the radio station—generally it was someone who I happily chat with in the hallways or on the sidewalk on campus. But do I really want them to have access to my photos, interests, notes, wall-posts, and the daily minutiae that I post in status updates? I don’t have anything embarrassing on my Facebook site, but I don’t want my students to have that large of a window into my personal life. I don’t know what I would say if a student said, “so, both of your kids had temper tantrums before bedtime last night?” Not embarrassing, but none of their business either. So, I could deny them the friend request. Many faculty do just this. However, it is truly flattering to have students show this kind of interest in me. And as I said, usually these are students that I enjoy getting to know. Then I discovered a solution. I read two articles (How to Friend Mom, Dad, and the Boss on Facebook…Safely and 10 Privacy Settings Every Facebook User Should Know) which describe Friend Lists. 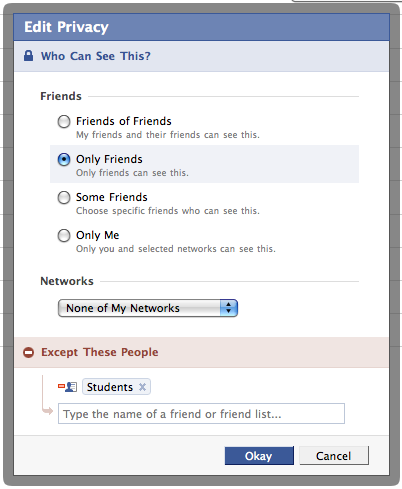 It is possible to use friend lists to fine-tune your privacy settings so that certain friends can only see limited parts of your Facebook profile. create a friend list containing all my students and give them access to only those parts of my profile that I wanted them to see. I did that, then I posted my Facebook policy on my website. Stress gone! Here’s a quick tutorial for how to set this up. Step 1. Make a friend list called Students. To do this, click on the Friends link at the top of your page. Then on the left-hand side click on the Make a New List button. Finally, name your new list Students. Step 2. Add all of your students to this list. You can do this by typing in their names one at a time or, after clicking on Select Multiple Friends, check them off of a grid of your entire friend list. Step 3. 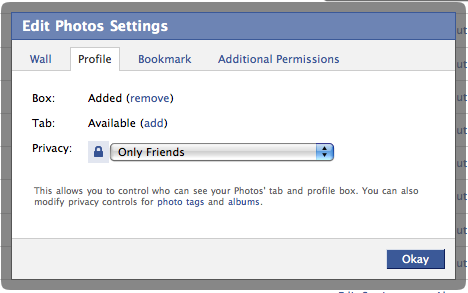 Customize your privacy settings. All of the privacy settings can be found in the Settings menu at the top of the page under Privacy Settings and Application Settings. For example, suppose you do not want your students to see your photos (not even photo tab on your profile). Select Application Settings—this will bring up a list of your applications. One of them is the Photos application. Click on the Edit Settings link. This will bring up the following window. Choose Only Friends, None of My Networks, and in the box for Except These People enter Students. Repeat this process for other items that you want to restrict. Here are some suggestions, and where to find them. Step 4. Verify that your restrictions worked. Go to Settings>Privacy Settings>Profile>. Near the top of the page there is a box that says See how a friend sees your profile. Enter a student’s name and you will see your profile as they would see it. Step 5. Categorize new friends. Steps 1–4 should do the trick for all of your current student-friends. When you get a new friend request from a student, you can add them to a list at the same time you accept their friendship by clicking Add to a Friend List. Thus they have restricted access right from the beginning. As a final comment, note that friend lists are like tags—a single friend can be part of multiple friend lists. Just stumbled on your blog while looking up some things on Cayley tables. Very informative stuff. Anyway, I do have lists on Facebook, but I don’t put all my students into the same category. I guess I’m of the opinion that you shouldn’t put anything on Facebook that you wouldn’t want to see in a newspaper anyway. Personally, I have pretty low standards in that department, but then, with me, you get what you get. Thanks for the comment! I completely agree about not writing anything that you wouldn’t want to see publicly exposed. It is more that I don’t want (or I’m not sure that I want) my students to see everything, all the time, in real time. That seems like too much for me.